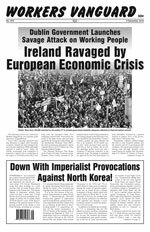 Comrades and sympathizers of the Spartacist League, Spartacus Youth Clubs and Labor Black Leagues successfully concluded a six-week subscription campaign this fall, reaching out to new readers and regions where we do not have branches and making contact as well with longtime readers of our Marxist press. We exceeded our national quota of 2,175 points with a total of 2,555.5 points, with every local surpassing its quota. These points represent 1,146 subscriptions to Workers Vanguard, 80 to Espartaco (published by our comrades of the Grupo Espartaquista de México) and 74 to the press of other International Communist League sections. Our annual subscription drive is always a major national campaign, introducing readers not only to the biweekly WV but also to our international theoretical journal, Spartacist, our pamphlet series Black History and the Class Struggle and other ICL publications. The campaign also serves to give us a picture of current political consciousness and moods, from campuses to workplaces and union halls. This subscription drive took place in the context of the continuing capitalist economic crisis—the worst since the Great Depression. While working people are reeling under the impact of layoffs, home foreclosures and budget cuts, students have been especially impacted by the slashing of financial aid. We encountered a lot of questions about Marxism and doubts about whether socialism can really work. At the same time, many people we talked to expressed hatred of capitalism and its effects. Our 2009 pamphlet, Capitalist Anarchy and the Immiseration of the Working Class, was one of the most popular giveaways. People who bought subscriptions were often already left-leaning in some way or interested in Marxism in general due to life experience or their reading and wanted to find out more. This provided us an opening to explain our aim of building a revolutionary workers party to lead the working class in the overthrow of the capitalist system. Several subscriptions were sold on the basis of interest in the 1917 Russian Revolution and Soviet history, giving us an opportunity to highlight such publications as our pamphlet Lenin and the Vanguard Party, which explains the crucial role that the Bolshevik Party played in leading the first successful workers revolution. Our opposition to capitalist politician Barack Obama (and all capitalist politicians, whether Republicans or Democrats) has set us apart from our reformist opponents, who celebrated Obama’s election as U.S. imperialism’s Commander-in-Chief. We have always maintained that Obama and the Democrats represented a facelift for the U.S. capitalist ruling class to better pursue its bloody aims abroad and its exploitation of working people at home. Indeed, the Obama administration has stepped up the war in Afghanistan while deporting nearly 390,000 immigrants in 2009 (an all-time high), further shredding civil liberties and attacking unions representing auto workers, teachers and others. Comrades from New York intervened at the October 2 “One Nation Working Together” rally in Washington, D.C., sponsored by the AFL-CIO and NAACP. Taking place a month before the midterm elections, the rally was unmistakably an electoral push for the Democrats. The labor misleaders pushed the lie of “national unity” between workers and their class enemy, telling workers hit by unemployment that the answer is more protectionism—i.e., that the workers from other countries are their enemy, not the U.S. capitalist class. Doing their bit to keep working people tied to the capitalist Democratic Party, the reformist left avidly supported this flag-waving affair, which was given a bit of a left gloss through a “Socialist Contingent” composed of the International Socialist Organization, Socialist Action, Solidarity, Socialist Alternative, et al. We counterposed our revolutionary internationalist program to the rally’s pro-Democratic Party class collaborationism and the labor tops’ China-bashing and had several polarizing debates with members of opponent groups who came by our literature table. Several locals reported that our placards and articles on China garnered a lot of attention and sparked discussions on our Trotskyist analysis of China and the other bureaucratically deformed workers states—Cuba, Vietnam and North Korea. People were notably interested in the major strike wave this spring and summer involving young migrant workers (see “Militant Strike Wave in China,” WV No. 961, 2 July, and “China: Labor Struggles in the ‘Socialist Market Economy’,” WV Nos. 964 and 965, 10 September and 24 September). A comrade reported from North Carolina that especially due to those strikes and the Stalinist regime’s response to them, “we sensed a greater openness to considering our arguments that China is not capitalist.” Our program of unconditional military defense of China and proletarian political revolution to overthrow the Stalinist bureaucracy was the topic of a heated debate at our sub drive forum in Chicago. Another issue that resonated with workers and students was our call for “full citizenship rights for all immigrants,” which was featured in the public forums held by our locals during this campaign (see WV No. 969, 19 November, for the presentation in New York). Comrades from Los Angeles went to Arizona, where they sold many subscriptions to students who saw our signs denouncing the anti-immigrant witchhunt carried out by both Democrats and Republicans. A number of students were also interested in our WV articles on science denouncing medical quackery, as well as in our defense of gay rights. Our signs for “Free Abortion on Demand!” were often polarizing, a measure of socially conservative moods and religious beliefs held by many students. New York comrades made a trip to New Orleans that coincided with the fifth anniversary of Hurricane Katrina, where the racist capitalist rulers showed their utter disdain for the lives of the poor and black population of the city. The team sold to a rally against budget cuts at the University of New Orleans that was brutally repressed by campus cops. One of the students met at the rally wrote to Workers Vanguard about the dire situation facing public education in the city (see “New Orleans Subscriber on Student Protest,” WV No. 965, 24 September). Comrades went to Puerto Rico as a follow-up trip after our visit in support of the two-month-long student strike against tuition hikes last spring, and to Montreal, where they worked with Canadian comrades in the Trotskyist League/Ligue Trotskyste. Our trips to the Pacific Northwest, Colorado, Charleston, South Carolina and other locations also gave us an important window into the current political consciousness, which we hope will enrich the pages of WV. Congratulations to all comrades and friends for their efforts, especially our new members who participated in their first sub drive. A salute goes out to comrade Gene in New York for selling the most subscriptions (95 points). We welcome new readers and those who renewed their subscriptions, and encourage you to let us know what you think of our press and to get involved in the activities of the Spartacist League, Spartacus Youth Clubs and Labor Black Leagues.